Howdy! I’m Ryan Kulp, founder of Fomo. Fomo is a conversion rate optimization tool that increases website conversions by showing off recent customer behaviors. Before Fomo I started (and failed) 3 companies, and worked as a marketer both full time and as a freelancer at more than 30 venture-backed startups over 5 years. I spent my teenage years in angst as a performing musician. I recorded several albums, performed 100s of times, and made approximately $0. I wasn’t interested in technology or programming, or even marketing. But as I built side hustles in college, from hookah catering to pin-back button manufacturing, I got more acquainted with consumer-buying behavior — why we do what we do. I also had the opportunity to work with great brands like Red Bull, Microsoft, Teach for America, and a dozen more, doing experiential events and PR stunts. All of this came together with Fomo, whose premise requires an intimate understanding of herd mentality, word of mouth marketing, and of course: social proof. Today, Fomo has over 5,000 paying subscribers, and last month we made about $88,000. We’re also bootstrapped, with the exception of a $150k convertible debt loan that we intend to pay back with interest. I’m thrilled to share our journey so it can be replicated by indie hackers everywhere. What motivated you to get started with Fomo? 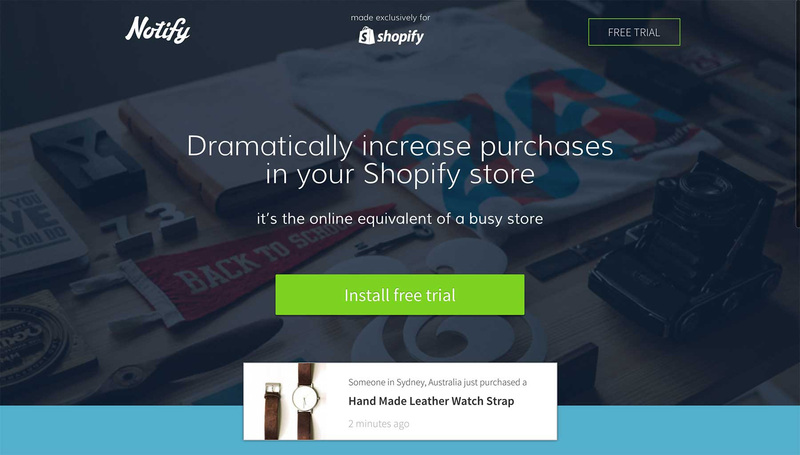 In March 2016, my partner Justin and I acquired a Shopify app called Notify. In four months we rebuilt and rebranded Notify to Fomo, relaunching on Product Hunt in August 2016. During the rebuild, and for several months afterward, we both worked full time at other companies — me in venture capital and Justin in ecommerce. It’s kinda embarassing to admit, but we considered Fomo a side project and only dedicated 1-2 nights/week to hacking on it. Martha Stewart signed up. Hint Water too. We served a billion Fomo notifications. Our servers crashed during Black Friday. As more multi-million dollar brands began relying on Fomo to improve their conversions, we knew this was special, and that it needed more attention. Luckily I had been learning to code for around six months when we acquired Notify, and working with experienced engineers expedited my dev chops significantly. This allowed us to respond to customer requests very quickly, shipping new integrations in as little as a few hours, or bug fixes in as little as five minutes, even after midnight on a weekend. To answer your question, what motivated us to start and grow Fomo is the absence of honesty and transparency in a lot of marketing organizations. Most marketers seem more interested in creating fake hype, fake urgency, fake fear (loss aversion), fake value. The future of digital marketing will not be Facebook advertising, or any form of paid media. Rather, the future of marketing relies on businesses being able to scale their word of mouth. Fomo provides a strategy to do this, and our clients are seeing incredible results for about a buck a day. The app we bought, Notify, was just a few dozen PHP scripts. We knew this wouldn’t scale, so we hired a dev shop to do the leg work on Fomo version 1.0. We also weren’t happy with the architecture, a tight 1:1 between “data” (recent Shopify orders) and their presentation (the notifications). Abstracting this into something more flexible became our thesis for the Fomo rebuild. This also allowed us to launch plugins for several of the world’s leading e-commerce tools within a few short weeks. Three hours after closing the Notify acquisition, our first developer added a simple “powered by” link to all notifications. This drove thousands of hits to our site, but also a couple dozen angry customer emails. In other words, our first product-marketing decision was a total fail. We reverted the change before midnight on the same day. It’s funny to see competitors still using this tactic, given customers hate it. Justifying backlinks like this under the guise that “your visitors will know it’s real” is yet another example of many in the arsenal of dishonest marketing strategies we intend to remedy. Seed-stage products are fun because even 10 extra hits/day can move the needle. I don’t recommend scaling beyond predictable, high-quality traffic to spray and pray sources (i.e. ads) until you need to. In total we spent four months and around $40,000 building Fomo v1.0. These expenses went to developers, hosting, and tools like Mailchimp/Mixpanel/Gmail. We almost broke even, thanks to revenue during that period. As for the $10,000 that was over budget, we put it on a 12-month, 0% interest credit card from Chase. If you’re bootstrapping, responsible, and careful, consider credit arrangements like these. They act sort of like venture capital, getting you over the product-market fit hump, investor-free. How have you attracted users and grown Fomo? We’re incredibly fortunate that Fomo is a visible product. To give a sense of scale, Fomo serves more than 500 million notifications per month — all of which is tracked in our stats server, hosted on Google BigQuery. When someone signs up they instantly join our sales team, except they pay us instead of the other way around. In particular, the viral coefficient is even higher when that customer is part of a niche industry or use case. For example, a few months ago we got our first crypto client. They were about to ICO and wanted to show off live signups and commitments on their FAQ page. Within a couple weeks, a dozen other token sales came onboard, most likely because they were tracking ICO events and looking for best practices. This also happens through direct competition. Wannabe clones spend heavily on paid media, even using Fomo customers in their marketing materials. But within days of acquiring a free trial, many of their hard-earned prospects switch to us. Conversely, we scraped the websites of more than 700 Fomo free trial cancellations, and only 2 of them had switched to a competitor. The lesson here is that, if you have the best product, while it won’t sell itself, savvy shoppers will find you in their own diligence, after clicking an expensive ad from your competitors. We also grow through partnerships with larger companies. It’s generally tough to create symbiotic relationships with the “bigger guy,” but most of the platforms we partner with already have formalized processes for co-marketing, private API integrations, and so forth. Our strategy, in a nutshell, is to NOT ask for permission. We simply build what we can with the docs available to us, then send a completed demo/GIF to the partner manager after it’s live. This causes some partner prospects to insist on getting to know us, changing the co-marketing dynamics completely. At that point, we have decent leverage with which to establish revenue share agreements, endorsed backlinks, etc. It’s this literal end-user exposure, along with our engineer-backed support team and best-in-class product, that drive most of our growth. No fancy marketing campaigns, no Facebook ads, no cold email, no ‘last chance! offer expires today!’ webinars. Fomo charges a monthly subscription fee, ranging from $11.99 to $750. Most users are on our $29-49 dollar plans. Since day one we’ve dedicated significant resources to excellent technical support, since many users want customizations unique to their website. As a result we have more features and configurable settings than anyone on the market, which further increases the complexity, begetting the need for even more customizations. Kind of an interesting paradox, or hedonic treadmill. Our current customer base (5,000+ paying) and revenue ($88k MRR) is strong. At this time we’re more focused on adding value to our existing customers (thus increasing ARPU) than doubling our customer base. So far this strategy has worked well, given we’ve increased prices three times in the past 12 months. Selling annual plans also helps, because a single annual plan (for a larger customer) is several thousand dollars in additional revenue, in one click. We’re finally doing “marketing” in 2018. Our goal is to make a ruckus, and we’re launching an experimental PR campaign this Spring. Our team also just produced a short film in-house, which was a lot of fun and another non-conventional way to express our point-of-view. What are the biggest challenges you’ve faced and obstacles you’ve overcome? Providing high-quality customer support is our biggest challenge, but also the biggest opportunity. Over two dozen ripoff competitors have launched over the past year, but none of them have multiple full-time engineers working directly with customers 11 hours per day. We’re vigilant about 9:30am-8:30pm EST live chat hours, which is unheard of for our size and industry. Another common obstacle is meeting customer demand. Fomo launched with three integrations — Stripe, Zapier, and Eventbrite — but has since added more than 40 others, as well as an API, custom webhooks, and more. To achieve this we refactored our integrations architecture from 1,000+ lines of code per integration to as few as 80. Short answer: reading a book every week. Longer answer: our core advantage is our team — their technical skills, customer empathy, and genuine interest in our vision: To give honest entrepreneurs the credibility they deserve. Consistently communicating and demonstrating this to ourselves and our customers has driven deep product insights that lead to a robust roadmap of next gen features. We’re also lucky to have been first-to-market, which makes thought leadership more natural and thus builds customer trust. Keep your day job. Not forever, but until your side project is bursting at the seams with needle moving todos. For the first 13 months of Fomo I worked full time and freelanced to keep the ship afloat. Even after going full time in early 2017, I still didn’t get my first Fomo paycheck for another nine months. Our Instagram is pretty kickass, but the platform pays our rent. Fomo is anti-hype, so I won’t try to sell you. The truth is, businesses either value social proof or they don’t. They value lowering customer acquisition costs, or they don’t. Because I’m a big Indie Hackers fan, I’ll respond to every question or comment below. Thanks again.